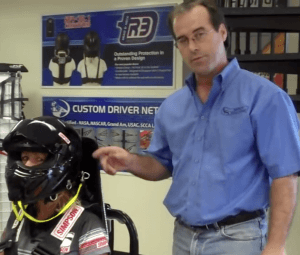 Ever since Dale Earnhardt’s death back in 2001, the use of head and neck restraint devices has increased, and in some events they’re mandatory. But what if you track a stock production car with standard OEM Seatbelts where a HANS device doesn’t work for you? There is one device that is FIA certified to work with OEM belts – the Hybrid-S – invented by Trevor.